There seems to be a trend in online slots that can only be termed, 'pure nostalgia'. 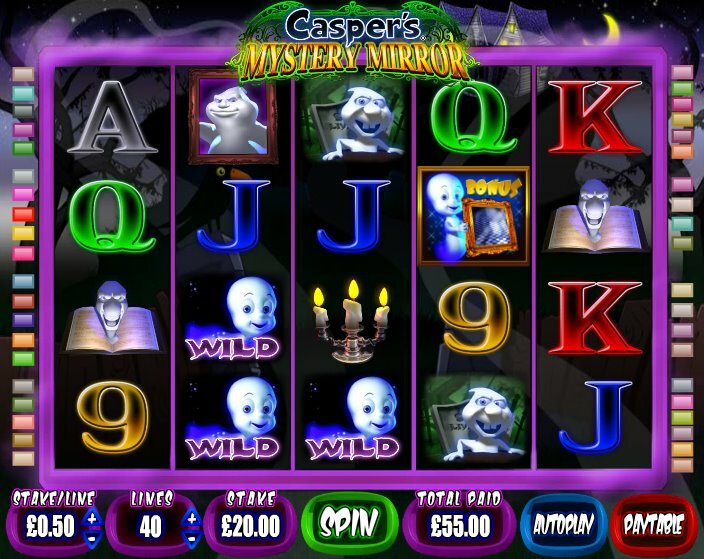 Whether it's harking back to classic video games (Centipede), comics (Viz) or cartoons and comics, like this slot from prestigious developer Blueprint Gaming based on the tales of Casper the Friendly Ghost, slots developers seem intent on taking players - who are all adults now, remember - back in time for a little Memory Lane-treading. 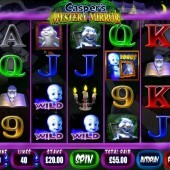 Casper's Mystery Mirror is a 5 reel, 40 pay-line online slot which celebrates the comics and long-running TV cartoon (and later, movies) of the boy ghost and his pals. If you ever watched Casper as a kid then you will know exactly what to expect but for those of you who are less familiar with our ghostly friend then let's delve a little deeper. On the reels we get images of Casper, his Ghostly Trio pals (Stretch, Stinkie and Fatso), candelabra, a spellbook, plus the usual 9-through-Ace symbols. The Wild Symbol features Casper and substitutes for all symbols expect the Scatter. Free spins can be won by hitting three Casper Bonus Scatters on reels 2, 3 and 4. You will only win 5 spins at a straight 1x multiplier, but there's an extra bonus to enjoy. Look Out for the Mystery Mirror! The 'Mystery Mirror' feature runs during free spins: if any Mystery Mirror lands in view a symbol will be chosen at random and 'appear' in the mirrors. Basically this is like a random or replicating Wild and means those 5 free spins can lead to some juicy jackpots. A fairly basic free spins round is all you can hope for when playing Casper's Mystery Mirror, yet there is potential for some big wins if you utilize the Mystery Mirror feature well during the free spins round. As you'd expect, cartoon and comic book tie-ins are everywhere in online slots, and some of the leading developers' most high-profile games have been associated with classic comic book characters. Cryptologic's DC Comics tie-ins and Playtech's Marvel slots are cracking to play, and the frenetic Wonder Woman slot or superb Captain America slot - from Cryptologic and Marvel, respectively - are good places to start. Both games have great bonus features and a genuine old-school feel for the source material.